I first became aware of Hull based four-piece LIFE when they were personally recommended to the audience at this years Live At Leeds Festival by IDLES. Lead singer Joe Talbot said “They are like us, but more refined”, anyone who meets IDLES seal of approval is alright by me, and after listening to their debut album “Popular Music” I am in complete concurrence with IDLES. This album delivers a smorgasbord of varied influences, uplifting choruses, and downtrodden social commentary. Opening with “In Your Hands” LIFE instantly show us what they are all about with punk ethics, howling guitars and riotous, explosive, choruses. Lead singer Mez Sanders-Green’s disenfranchised lyrics are at odds to the excitable, hyper, energy in the instrumentation, but yet they complement each other perfectly. Much debate has been made of whether or not “Popular Music” is intended as an ironic title. I am undecided on this but I think that their appeal is built on similar foundations to those of Cabbage. If you want the high energy, catchy licks, head banging moments and moments of euphoria then you will find those in abundance, especially in tracks like “Sugar God”, “Electricity” and “Euromillions”. However, if you are looking for something a bit more substantial, maybe some hard-edged political lyrics or some grittier composition you will also find this, often within the same tracks I mentioned previously. This is the beauty of LIFE, whatever you are looking to find within this album it is there for you if you look hard enough. This is best displayed in “Electricity” where they combine protest lyrics with punchy, nineties inspired, fast-paced and memorable chorus lines. LIFE produce moments reminiscent of punk greats like The Clash and grunge acts like Pennywise stirred up in their own unique style to make something which manages to simultaneously sound progressive and retrospective. 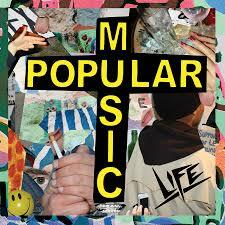 “Popular Music” is available now from iTunes on the Afghan Moon label.